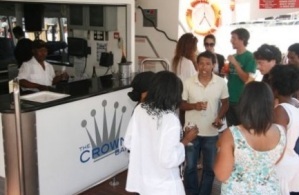 Luxury 140 passenger Catamaran Boat Charter Cape. 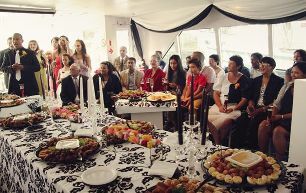 74ft LUXURY HIGH SPEED BOAT CHARTER from V & A WATERFRONT CAPE TOWN. 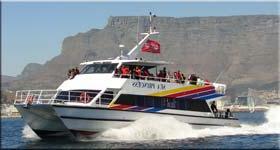 74ft Luxury High-Speed Catamaran Cape Town. Mooring: V & A Waterfront, Cape Town. Passenger Capacity: 140, 115 buffet, 104 cinema style, 40 sit down meal. Catering, barbecue and bar facilities. R38 000 two hr. minimum at sunset. Above rates are valid until 31st December 2019. 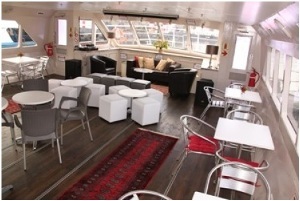 Join this luxurious Princess of the Sea, the largest function passenger carrying boat from the Waterfront, for scenic Boat Cruises along the Atlantic Seaboard: Cape Town Harbours, with views of Table Mountain, Lion's Head, Robben Island, Sea Point, Clifton, Camps Bay and the Twelve Appostles. Self-catering at no extra charge or menus available. 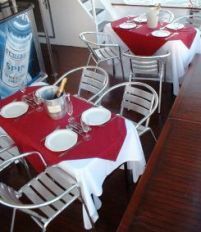 Sea Food Barbecue from R375 per person. Buffet Dinner: Entre', Chicken and Steak, veg, Dessert. Finger Snacks R210 pp. Platters. Boat Charter Enquiry Form . Restaurant Boat Dinner Lunch Cruise.